From his book "Lazarus Come Forth! Meditations of a Christian Esoterist"
Valentin Tomberg was an unrecognised genius of the 20th Century. He was born in 1900 into a Lutheran family in St. Peterrsburg. His parents were killed during the Russian Revolution. He was strongly influenced by Vladimir Solovyev and a personal experience of the Sophia at a cathedral in Holland. Also influenced by Rudolph Steiner, he lectured in Holland and England. He was active in the Dutch Nazi resistance. 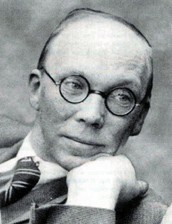 He later converted to Catholicism and worked for the BBC Russian monitoring service in Reading, England, while devoting his time to writing and meditations. His major works are Christ and Sophia, The Tarot and Christian Hermeticism (published posthomously and anonymously) and Lazarus Come Forth! He died while on holiday in Majorca in 1973. In mentioning "signs", "wisdom" and love, St Paul gives prominence to love. The other two - taken by themselves - do not suffice to do justice to the mystery of love, the mystery of the Cross. "all things were made, and nothing that was made was made without him." Similarly Genesis does not give a complete account of the countless details of the archetypal miracles - the creation of the world - but limits itself to the seven acts of creation, that it designates as days. 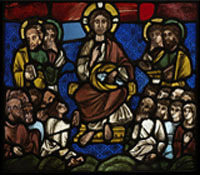 Just as with the seven miracles of Jesus in the Gospel of St. John, it portrays the most significant acts of the creation. For Genesis describes the sevenfold miracle of creation and the event of the Fall, where this creation "fell" into what we now call "natural evolution" - with toil, suffering and death. The Gospel shows us how the divine Word became flesh and accomplished seven creative acts, analagous to those of creation, but now as acts of healing of this fallen world. Each miracle of the Gospel of St. John takes place in reverse sequence of the creative miracle working of the Divine in Genesis. Where creation was completed, there healing begins. When the ruler of the feast had tasted the water that was made wine and knew not whence it was (but the servants who drew the water knew), the governor of the feast called the bridegroom, and saith unto him, Everyman at the beginning does set forth good wine; and when men have well drunk, then that which is worse: but but thou has kept the good wine until now. And on the seventh day God ended his work which he had made. And God blessed the seventh day and sanctified it; because that in it he had rested from all his work which God created and made. The miracle of the transformation of water into wine at the wedding at Cana - the first of the seven miracles in the Gospel of St John - is the "sign" revealing the seventh day of creation. The free union in love between God and the world, which was celebrated, blessed and consecrated on the seventh day of creation, became broken off through the Fall. If we consider that each miracle of the Gospel of St. John is simultaneously a teaching, a parable, a sign and an event, then we shall understand the significance of the of the miracle of the wedding at Cana, as the first healing act of the Word made flesh. And God made the the beast of the earth after his kind, and cattle after their kind, and every thing that creepeth upon the earth after his kind: and God saw that it was good. And God said, Let us make man in our image, after our likeness: and let them have dominion over the the fish of the sea, and the fowl of the air, and over the cattle, and over all the earth, and over every living thing that moveth upon the earth. So God created man in his own image; male and female created he them. And God blessed them, and God said unto them, Be fruitful and multiply. And the evening and the morning were the sixth day. 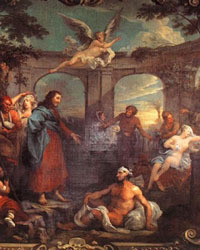 Listen to Chapter 4: There was a certain nobleman, whose son was sick at Capernaum. The archetype of the human being is God himself. The sickness that arose as a tragic consequence of the Fall was a change of direction in the mirroring process of heridity; it changed from being vertical to becoming horizontal - to becoming evolution in time. 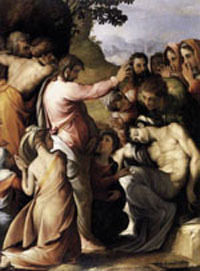 The miracle of the healing of the nobleman's son is the "sign" of the essence of the sacrament of baptism, as the restoration of fatherhood and sonhood, which have their archetype in the sixth day of creation. Listen to Chapter 5: Rise. Take up thy bed and walk. When Jesus then lifted up his eyes, and saw a great company come unto him, he saith unto Philip, Whence shall we buy bread, that these may eat? 6:6 And this he said to prove him: for he himself knew what he would do. Philip answered him, Two hundred pennyworth of bread is not sufficient for them, that every one of them may take a little. One of his disciples, Andrew, Simon Peter's brother, saith unto him, There is a lad here, which hath five barley loaves, and two small fishes: but what are they among so many? And Jesus said, Make the men sit down. Now there was much grass in the place. So the men sat down, in number about five thousand. And Jesus took the loaves; and when he had given thanks, he distributed to the disciples, and the disciples to them that were set down; and likewise of the fishes as much as they would. When they were filled, he said unto his disciples, Gather up the fragments that remain, that nothing be lost. Therefore they gathered them together, and filled twelve baskets with the fragments of the five barley loaves, which remained over and above unto them that had eaten. And God said, Let there be lights in the firmament of the heaven to divide the day from the night; and let them be for signs, and for seasons, and for days, and years: 1:15 And let them be for lights in the firmament of the heaven to give light upon the earth: and it was so. And God made two great lights; the greater light to rule the day, and the lesser light to rule the night: he made the stars also. And God set them in the firmament of the heaven to give light upon the earth, 1:18 And to rule over the day and over the night, and to divide the light from the darkness: and God saw that it was good. And the evening and the morning were the fourth day. The fourth day of creation is the coming into being of those principles of the world orchestra that direct "time and tempo" - the creation of the "sun, moon and stars". And the fourth miracle in the Gospel of St. John - is the corresponding healing work of the Word made flesh. For as the Sun - raying out light, warmth and life - "nourishes all beings and unites them in a community of "nourishment", so Jesus Christ functioned at the feeding of the five thousand as the "nourishment giving centre" for the five thousand. The disciples received and passed on the blest (eucharistic ) bread, just as the moon receives and passes on the light of the sun in a dimmed, toned-down form. So it was the disciples, who took up the mighty, enlighteniong, warming, life-giving force of the cosmic Word made flesh and passed it on as a "reflection", i.e., they toned it down to the level of "refreshment and nourishment". Thus the five thousand did not pass into a condition of ecstacy, but were simply refreshed and strengthened, or fed. Aside from Christ and the disciples, the people (the five thousand) also participated in the miracle. In addition to the sun and moon principles, the "star" principles were also at work in the "sign" of the feeding of the five thousand. The five thousand became - within their individual boundaries - like Christ, i.e., "bread multipliers". They became efective sources of light. A star principle differs from the moon principle, in that it does not reflect light, but rays forth of itself. "Stars" in this sense are "sun seeds", "sprouting sun corn". And God said, Let the waters under the heaven be gathered together unto one place, and let the dry land appear: and it was so. And God called the dry land Earth; and the gathering together of the waters called he Seas: and God saw that it was good. And God said, Let the earth bring forth grass, the herb yielding seed, and the fruit tree yielding fruit after his kind, whose seed is in itself, upon the earth: and it was so. And the earth brought forth grass, and herb yielding seed after his kind, and the tree yielding fruit, whose seed was in itself, after his kind: and God saw that it was good. And the evening and the morning were the third day. There came into being entities (monads) that are sovereign over the world of energies (the "sea") and also sovereign over condensed substance (the "earth"), because they bear their own solidity within themselves and can condense themselves themselves, as well as bearing within them their own mobility, theirvown energy or "sea". They are independent of both the "sea" and the "earth" principles, because they bear in themselves these principles. They are in the world but not of the world, We are now in the midst of the fifth miracle of the Gospel of St. John: the miracle of the waling on water. 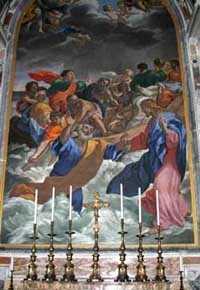 For this miracle - as an event and a "sign" - is the independence of the Son of Man with regard to the sea and the land. And God said, Let there be a firmament in the midst of the waters, and let it divide the waters from the waters. And God made the firmament, and divided the waters which were under the firmament from the waters which were above the firmament: and it was so. And God called the firmament Heaven. And the evening and the morning were the second day. The second day of creation according to Moses' account is the genesis of the firmament, dividing the waters that were under the firmament from the waters that were above the firmament. To understand (stand under) means to make a movement that brings into relation the reflecion above, the ideal, with the reflection below, the real. The healing of the man born blind tok place in the following sequence: After Jesus spoke the words: "As long as I am in the world, I am in the world", he annointed the eyes of the blind man with clay (that Jesus made from his spittle with the earth). 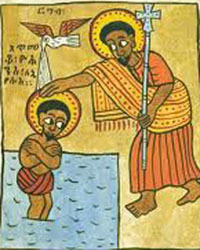 and then said to the blind man: "Go, wash in the pool of Siloam>" So he went and washed and came back seeing. The miracle culminated in a "seeing"faith. In the beginning God created the heaven and the earth. And the earth was without form, and void; and darkness was upon the face of the deep. And the Spirit of God moved upon the face of the waters. And God said, Let there be light: and there was light. And God saw the light, that it was good: and God divided the light from the darkness. And God called the light Day, and the darkness he called Night. And the evening and the morning were the first day. We cannot make anything of the first sentence of Genesis if we do not read it meditatively. The striving or yearning for the exalted, for cooperation with the Divine, is designated in the first day of creation as "heaven", while the striving or the yearning for humble devotion, for pure mirroring of the Divine , is referred to as "earth". The call of the divine Word: "Let there be light", which awakened the hierarchies (the seraphim, cherubim, dominions, mights, powers, principalities, archangels and angels, which had been resting in darkness) on the first day of creation, resounded powerfully again in tha call of the Word made flesh: "Lazarus Come Forth! 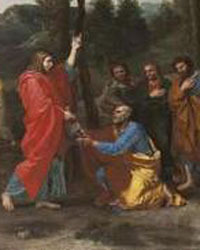 ", the seventh miracle of the Gospel of St. John.